Just when you thought s'mores couldn't get any better, we upped the ante. These oven-baked banana boats combine the irresistible gooeyness of golden marshmallows and melted chocolate with fresh banana and strawberries. The result? A campfire-inspired treat that might be even better than the original. 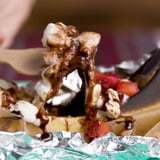 Plus, these banana boats are much less messy than traditional s'mores — for one thing, you can eat 'em with a fork! We've partnered with Gold Peak Tea to help you host the ultimate party for your friends and family. 2. Using a paring knife, cut a very small slice from the bottom of the banana to help it stay flat on the baking sheet. Cut out a rectangle from the top of the banana and remove that piece of the peel. Using the small end of a melon baller, scoop out some of the banana. Repeat with the remaining three bananas. Wrap each banana in parchment paper and tin foil, leaving the cavity exposed. 3. Sprinkle the dark chocolate chips and walnuts into each banana and press them into the cavity. Top with the mini marshmallows. 4. Transfer to a baking sheet and bake for 12 minutes. 5. Once the marshmallows turn golden-brown, remove from the oven and allow them to cool for 5 to 10 minutes. 6. Drizzle with chocolate sauce and sprinkle with chopped strawberries. Serve warm!